The British Academy of Film and Television Arts have been running occasional events aimed at the games industry for most of the last year. The latest of these was particularly notable – an hour-long chat with David Braben, head of Frontier Developments and one half of the creative team behind the classic computer game Elite, timed to coincide with its 25th anniversary. 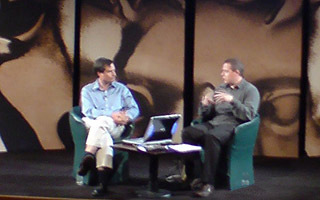 Braben’s career was discussed in roughly chronological order, starting with the circumstances which led him (and fellow Cambridge student Ian Bell) to develop one of the first (if not the first) 3D home computer games. The details of this (astonishing) tale may have been familiar to most of the audience (having been chronicled by Francis Spufford in his book Backroom Boys: The Secret Return of the British Boffin, which was later televised as part of Brits Who Made The Modern World). Braben noted that he’d originally been drawn to 3D graphics rather than games specifically, with a desire to render them at an acceptable speed being the reason for his early move to low-level assembly programming, and (if I understood correctly) that he’d only been programming for two years by the time Elite was released. It was also revealed that the colour status display (a neat trick on the BBC Micro which Acorn themselves didn’t know was possible) was a feature they had coded for a sequel to Elite, but which was folded back into the original shortly before release. After briefly talking about how the process of porting Elite to a seemingly endless procession of obscure formats dulled their enthusiasm, some time was given over to the story of Lander, Zarch and Virus (three iterations of the same basic game). Braben explained exactly how awesomely powerful the 32-bit Archimedes computer was compared to anything else available at the time, and the difficulty that arose in trying to port the game down to the comparatively weedy 16-bit computers. The conversation then moved on to the Elite sequels (Frontier and First Encounters). The interviewer (gi.biz‘s Phil Elliott) got into a bit of a pickle here, seemingly not quite realising that First Encounters had been released in a severely unfinished state as a result of publisher pressure and trying to segue this into a point about patching games after launch. Things got back on track with a look at some of Frontier Developments’ post-Elite projects, including V2000 (the striking title screen of which immediately brought back my long-forgotten memories of playing the game briefly in 1998) and A Dog’s Life (which, we found out, featured animation which caught the attention of Aardman Animation’s Nick Park, leading to Frontier being approached to develop the first Wallace & Gromit games). The talk was rounded off with a look at Frontier’s forthcoming games (LostWinds part 2, The Outsider and, naturally, cryptic hints about Elite IV), a Q&A session and Braben’s thoughts on the state and future direction of the industry (in a largish nutshell: games are still in their infancy, we haven’t figured out all the potential uses for the technology we already have, games are going to become better at telling dynamic stories, and characters and worlds are – at least in the example he gave of the film Star Wars – often more interesting than the archetypal stories that they happen to move through). It should also be noted that David Braben successfully managed to manually dock, live on stage, while being interviewed.